This full-frame mirrorless camera is a major turning point for Canon, embodying both risk and reward in one very capable and commendable product. Change is one of those things many thrive, yet which many are apprehensive about. The Canon EOS R is all about change: the company's first full-frame mirrorless camera embodies a new lens mount, new layout and methods of working, yet has more than a nod to Canon tradition at its very core. After the announcement of the camera, we got to spend a day shooting in what we can only be described as the most kooky yet out-of-this-world live and interactive theatre production. Like being on a film set based in the future, over 100 international journalists and photographers were given free rein to explore the site as the actors worked through the plot in real time. Is the vision of Canon's full-frame future a change for the better or a step too far? First thing's first: that new RF lens mount. This lens line-up arrives with four optics from day one, all of which have high-end users in mind. The 50mm f/1.2, for example, costs £2,350 – making it the same price as the camera body. Part of the point of the EOS R having a new lens mount is for the shorter flange back distance (it's 20mm between rear of lens and the sensor) making it possible to create lenses smaller than their DSLR (EF mount) equivalents. Yet the 28-70mm f/2 and 50mm f/1.2 RF lenses are massive optics. So don't buy the EOS R if you're looking for an ultra trim and portable system; it's a full-frame setup and it feels like it. 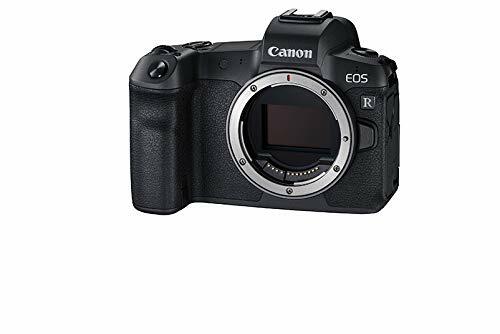 That said the EOS R is smaller than a DSLR like the 5D Mark IV, for example, thus the mirrorless system's layout has changed to adapt for its smaller footprint. Which brings some clever ideas along with some slightly taxing ones. See, change is good and bad all at the same time, right? Principal to the R's additions is what's called the M-Fn Bar, a left/right tap-touch bar on the rear that's not a clickable set of buttons, moreso a sensor. It's fully programmable, so you can have it toggle between, say, ISO sensitivity, AF area types, white balance and so on. Problem is it needs to be tapped to activate it, then press-and-held before it'll fully engage. Which is just silly; it needs to be customisable as to how reactive it should be, as many users would leave this active at all times for rapid adjustment of important settings. Give with one hand, take with the other. Next up, the EOS R has a top display (which can be illuminated for use in the dark), which presents the most prevalent shooting information, but which is a lot smaller than its 5D IV equivalent. Small doesn't mean it's bad, though, as we've found this panel to be useful for quick glances. The bigger problem is the relationship between this top display panel and the mode and M-Fn buttons. Because of the space limitation, the usual WB/metering, driveAF, exp comp/ISO is all moved to that single M-Fn button, then the front and rear dials are there to rotate through such settings. Which means a lot of scrolling and less immediacy. The M-Fn Bar goes some way to counter this, but it's still not particularly quick to select a new mode and adjust exposure. Ultimately, using the EOS R will be a learning curve if you're a staunch Canon DSLR user. You'll find a lot to love about the potential of its customisation - a load of buttons can be customised too, plus the lenses feature control rings that are programmable to adjust settings - but you'll need to bed in, take your time, and get everything setup as you please. Being a mirrorless camera means the EOS R is all digital, so no optical finder to be found here. In its place is a built-in electronic viewfinder which is up there among the best on the market (it'll give the Panasonic G9 a run for its money), offering a massive view and high resolution with no lag issues even in low light. Being mirrorless also means the EOS R functions the same whether using the finder or the rear screen. And that rear screen isn't only large and resolute, it's built on a vari-angle bracket, which makes it hugely useful for waist-level, overhead and video work. We're so used to mounted LCD screens in mirrorless cameras now - something so many DSLR cameras lack - that its presence in the EOS R feels like an essential. When it comes to autofocus we've often complained about Canon's EOS M mirrorless line being too simplistic. The EOS R is entirely different, featuring a large number of focus areas: there's Face Detection and Tracking AF; 1 Point AF; Expand AF Area; and Zone AF. Combined with the M-Fn Bar and touchscreen it's easy to switch between them and utilise any of the 5,655 positions across the screen (literally the full screen, edge to edge, top to bottom). That said, the EOS R's small/large AF area size option is limiting, as we found some precision focus to be off the mark. When shooting with an f/1.2 lens in low light, the depth of field is so narrow that it's easy for things to fall out of focus, so greater precision would be great, such as manual over-ride with in-screen magnification. This is as much user error and skill as it is something that Canon could assist to improve though. By and large we're very impressed with the autofocus. It's fast, touch-enabled, and works down to -6EV, which is so dark that you'd struggle to see by eye. And having shot in a variety of situations where the EOS R brought images out of the shadows, it's quite incredible what you'll be able to shoot (especially with the 50mm f/1.2, we must say). Using Dual Pixel AF as the EOS R's autofocus system was inevitable. It's commendable, although can't match a top-spec Canon DSLR when it comes to continuous autofocus. That's one area we doubt sports-shooting pros will want to nab the R. Except for golf and tennis snappers, because the option of a silent electronic shutter can certainly be a benefit. In the right conditions, with the right settings, the EOS R's output quality is nothing short of exceptional. It's taken us a fair amount of time to get used to the camera's layout and setup, however, as flicker reduction killed our ability to shoot in burst mode, while failing to set a minimum shutter speed (which is possible within the settings) saw a number of our shots present some motion blur. A full-frame sensor at this 30-million-pixel resolution is obviously at risk of some blur due to handshake and subject movement, so ensure to keep those shutter speeds raised beyond the norm. Especially when there's so much resolution resolve on offer, as clearly shown in lower ISO sensitivity shots (such as the young chap with the stick-on eyebrows further up the page). That said, with a steady hand and subject, we've been able to shoot very low-light portraits with just ambient lighting at 1/30th sec, ISO 800, f/2.5. Take a look at our android friend a few paragraphs (she was a great character by the way). Not that high resolution means you can't have high ISO sensitivity. By default the EOS R operates from ISO 100 to ISO 12,800, but this can be pushed to 40,000. We maxed out the setting to shoot an aerial hoop act, who was backlit and moving in extremely dark conditions. Sure, we wouldn't use the frame at a large scale, but the camera handled the conditions admirably all things considered. On the video front, Canon clearly has Sony in its sights, as the EOS R offers 4K capture with clean HDMI out and Canon Log for a pro-grade workflow. Or just capture within the camera, although with just the one SD card slot (darn it) you might end up filling that card rather rapidly. The Canon EOS R isn't just a mirrorless version of the 5D Mark IV DSLR. Nope, this full-frame mirrorless is a major turning point for Canon, embodying both risk and reward in one very capable and commendable product. The ability to focus in near darkness, the potential for exceptional image quality, full-fat 4K video treatment to challenge Canon's Cinema range, and where the new RF lens line-up could take things - the 50mm f/1.2 might be expensive, but it's exceptional from what we've seen - are all exciting points. However, the EOS R isn't perfect at every turn. Existing Canon DSLR users may find the new layout and buried settings a little difficult to master from the off, while autofocus would benefit from more precision, plus continuous autofocus tracking can't out-rank a top-spec Canon DSLR in our opinion. Offering 30-megapixels only magnifies the chance of image blur too. Overall, however, the Canon EOS R lays the footsteps of Canon's future foundation. If the company's engineers can deliver better optical resolve from this lens system then, well, in 30 year's time we'll be reminiscing about this pinnacle camera. Sure, there's room for improvement, Nikon offers a very similar equivalent, and it's all very expensive, but the EOS R feels like an important product.